The Physical Basis of Electronics: An Introductory Course, Second Edition is an 11-chapter text that discusses the physical concepts of electronic devices. 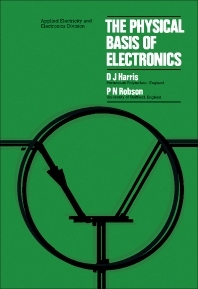 This edition deals with the considerable advances in electronic techniques, from the introduction of field effect transistors to the development of integrated circuits. The opening chapters discuss the fundamentals of vacuum electronics and solid-state electronics. The subsequent chapters deal with the other components of electronic devices and their functions, including semiconductor diode and transistor as an amplifier and a switch. The discussion then shifts to several types of field-effect transistor and the production of p-n junctions, transistors, and integrated circuits. A chapter highlights the four classifications of thermionic valves commonly used in electronic devices, namely, diodes, triodes, tetrodes, and pentodes. This chapter also considers the effect of small gas introduced to the characteristics of these valves. The concluding chapters discuss some of the basic modes of operation of electronic circuits and cathode-ray tube. This edition is of great value to undergraduate electronics students.